Since 2012, Keidanren and the American Chamber of Commerce in Japan (ACCJ) have, from a global perspective, publicized industry views on matters such as cross-border data flow, balancing use and protection of personal information, and cybersecurity#1. 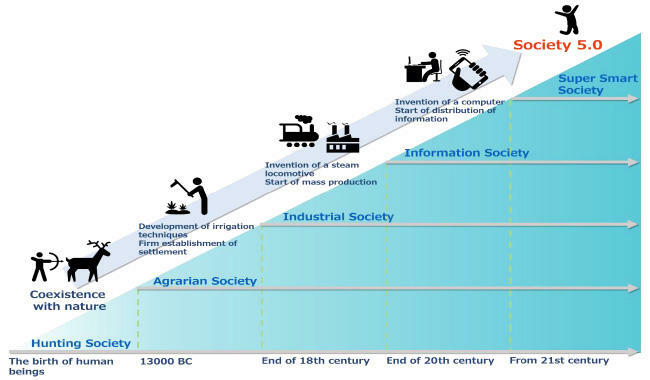 Keidanren has also advocated the Society 5.0 concept (see Figure 1), which aims to harness digital technology and data to achieve economic growth while also resolving social issues#2, and the ACCJ has supported the concept. Based on these views, we have created this joint declaration to review the status of the digital economy while suggesting the direction that Japan and the US should take, including specific measures that we recommend be addressed. Digital technology has already become part of our everyday life, and we have entered an era when all enterprises utilize and rely on information and communications technology (ICT). This digital transformation#3 (or digital innovation) is advancing to new levels and picking up speed with the emergence of cloud-based systems, data links, and innovative Information of Thing (IoT) and Artificial Intelligence (AI) technologies. Digital transformation is generating innovative products, services, and business models in quick succession, and digitization is providing vast amounts of data on goods, people, and services that can flow across borders instantly via the internet or other IT systems. Such data also enables people to visualize issues and share knowledge and insight into solutions, helping to create new values and resolve social issues. However, while utilizing huge volumes of data may drive global economic growth and enrich people's lives, it also raises new issues. Privacy and cybersecurity are at the top of the list. Although use of personal data enables provision of services tailored to individual needs, there is widespread concern over possible privacy infringements and misuse. Issues are emerging over improper data use leading to arbitrary control over people's conduct. It is also feared that centralized state control of data, based on the idea that cyberspace should be controlled by governments, could give rise to national security issues if such data includes information from other countries. In the IoT era all sorts of goods will increasingly be connected to the internet, and while this creates value in cyberspace, it also brings new risks by infinitely expanding targets and points of origin for malicious cyberattacks. Cyberattacks have not only stolen personal data, intellectual property, confidential information, and financial assets, but have also disrupted services and led to system failures. Countermeasures need to be developed from the perspective of value-creation and risk management. Advances in the digital economy boost data flow year-by-year, and since data is transmitted across physical borders with ease, it cannot be regulated by rules that are constrained within national or regional systems. In reality, however, data issues involve a complex tangle of challenges including the motives of countries contesting data, national security, maintenance of government systems, and human rights protection. A number of countries—including Brunei, China, Indonesia, Nigeria, Russia, and Vietnam—are already moving to enact and enforce what many characterize as "data localization" laws#4 (see figure 2). To protect privacy, new laws increasingly place conditions on the cross-border transfer of personal data. The EU General Data Protection Regulation that came into force in May 2018 establishes strict rules regarding transfer of personal data outside the region, the collection and handling of such data, profiling, and data portability. The EU is also deliberating an e-privacy regulation aimed at strengthening protection of electronic communications data. The spread of such endeavors to respond to this digital transformation in many countries and regions heralds the construction of a new global order. (4) construction and harmonization of global systems through U.S.-Japan leadership. Various cyberspace issues need to be addressed to ensure an environment where data can be used with peace of mind, including discussion of public policy around cybersecurity and IT literacy. To this end, innovation and corporate activity should be encouraged and systems harmonized from a global perspective. We desire the Japanese and US governments to take the initiative in this regard. In particular, we hope that both governments will keep working with the private sector on cybersecurity measures, building strong relationships that include the sharing of best practices in the cybersecurity field and driving more extensive capacity building. Ensuring cross-border data flow is a prerequisite to rolling out the digital economy on a global scale and enabling everyone to enjoy its benefits. The digital economy is built upon instant cross-border data flow via the internet, and the success of its global roll-out lies in enabling highly convenient services to people all around the world. Business in the future will be based not only on open markets, but also on enabling free cross-border data flow, offering digital services and handling vast amounts of data on goods and people via cloud-based systems. Data localization regulations can act as non-tariff barriers that impose additional costs and excessive business risks on firms. Moreover, they can impede economic growth in the regulating country. The impact on SMEs and start-ups trying to use digital technology to launch themselves into global markets is especially severe. The Electronic Commerce chapter of the TPP agreement contains high-level standards that ensure free cross-border transfer of information and prohibit requiring servers and other computing facilities to be located in a party's own territory and requiring transfer of, or access to, source code. Although the Unites States is not part of the TPP agreement, the governments of Japan and the US should press the standards expressed in the TPP, to jointly display their leadership, while cooperating with other countries to urge the easing or abolition of counter-regulations. This will help prevent excessive regulation from becoming the norm in developing countries in the Asia-Pacific region and elsewhere. In order to create a sustainable world by promoting a digital economy founded on cross-border data flows, it is important to continue generating innovation through a balance between use and protection of personal data, while avoiding extreme approaches that impose excessive or too-weak privacy protections. In this regard, systems and mechanisms encouraging cross-border data flows, including personal information, need to be developed globally, while maintaining a balance between innovation and privacy protection. The US and Japan should begin with encouraging the APEC Cross Border Privacy Rules (CBPR) system, to ensure appropriate protection and smooth flow of cross-border data. They also should strive for further maturity in practical enforcement of this framework and more support and involvement of APEC/non-APEC economies including securing the interoperability between CBPR and GDPR. The spread of IoT systems will generate many types of data, including data on goods themselves, and large amounts of data connecting goods to individuals. Emphasis should be placed on the handling of such data and the scope of information that should be protected for reasons of privacy. The US and Japan public and private sectors must work together to identify the positions adopted by other countries, deepen ties with like-minded countries, and engage in ongoing multi-stakeholder dialogue to gradually close gaps between countries. As well as engaging in strategy-based dialogue with the relevant authorities and other stakeholders in the EU, UK, China, Southeast Asia, and elsewhere, we hope that the governments of Japan and the US will play a leading role in using multilateral frameworks including the G7, G20, OECD, APEC, etc. to build and harmonize balanced systems worldwide, as well as support and encourage the spread of "internationally recognized standards", which makes business activities easier. In addition to collaborating with stakeholders in other countries, the business community should promptly and proactively participate in, and contribute to, international conferences and other multi-stakeholder fora to raise topics and drive discussion, especially on ensuring the free flow of data and promotion of investment and economic development through digital transformation. Business must also advocate for the creation of better societies with specific examples. The digital economy has brought about innovation by overcoming various barriers, including those separating organizations, industries, and countries. Countries everywhere are positioning digital economy policy as a national priority and promoting joint public-private sector initiatives, and digitization is transforming our world in remarkable ways day-by-day. We recommend that Japan and the US will make the implementation of digital economy policy a focus of national strategy. The private sector should create services that raise people's quality of life and actively manage its businesses to achieve digital transformation while building consumer trust. It should be ready and available to be an active partner in policy making, and in the establishment of best practices as the digital economy rolls out. Member companies of the Keidanren and the ACCJ are committed to promoting and leading innovation through digital transformation in order to create Society 5.0. They will do this by drawing on the industry's efforts and the support of individuals and communities, and continue to cooperate in global discussions to fulfill the aim of self-sustaining economic development and to enhance people's lives. In the 11th WTO Ministerial Conference held in Buenos Aires last December, Joint Statement on Electric Commerce was issued by likeminded 70 WTO members, which is likely to enhance the discussion on e-commerce at WTO. Taking this movement into consideration, we expect that if the governments of Japan and the US can work together to advance the Electronic Commerce chapter of the TPP agreement—which prohibits introducing data localization regulations and requiring transfer of, or access to, source code—in a form that expands application of those provisions to the financial sector; cooperate in upgrading and expanding CBPR membership; and collaborate on exporting high-quality infrastructure to third countries, it will clearly signal their intent to third countries facing the various issues outlined above. For this reason, we encourage both governments to take a positive approach to pursuing these possibilities. For example, see the letter regarding the digital economy jointly presented to the US and Japanese Governments by Keidanren and the ACCJ in April 2017. For example, see Keidanren's policy proposal on building innovation ecosystems to achieve Society 5.0, published in February 2018 (in Japanese). "Digital transformation" means dynamic situations where digitization connects various things and creates innovations and social transformations.